Liberty Women’s Swimming and Diving is off to a strong 3-0 start with a 159-98 win against Campbell and 50-38 and 185-117 wins against New Mexico State. This early success is not surprising after nine years of program history has laid the foundation to set up this year — the first year the team exists with elite-level facilities and a full roster. The 2018-19 season is the first that the Lady Flames have recruited divers to complete the swimming and diving program and experienced a full year of training and lifting in the newly constructed Natatorium and Liberty Athletic Center. The peak of the team’s season will take place in the end of February when they hold the Coastal Collegiate Sports Association (CCSA) Conference Championships for the first time on Liberty’s campus and go head-to-head against rival Florida Gulf Coast. Much of the Lady Flames season will revolve around preparing for this meet. Alicia Finnigan, senior butterflier and two-time NCAA qualifier, has three years of competing for Liberty under her belt. She believes the current team has the greatest capability of winning the CCSA Championship, which has not happened for the team since the 2013-14 season. She said the sophomores and juniors have worked hard and know what they need to do and the freshmen class has great potential. “I think that’s the way it should be in a growing program like ours,” Finnigan said. Last year, current sophomore Payton Keiner became the program’s second freshman to qualify and compete at the NCAA Championship meet last March. Keiner described her first year as one without many expectations and that allowed her to get adjusted to each new aspect of life with a new team and different training. 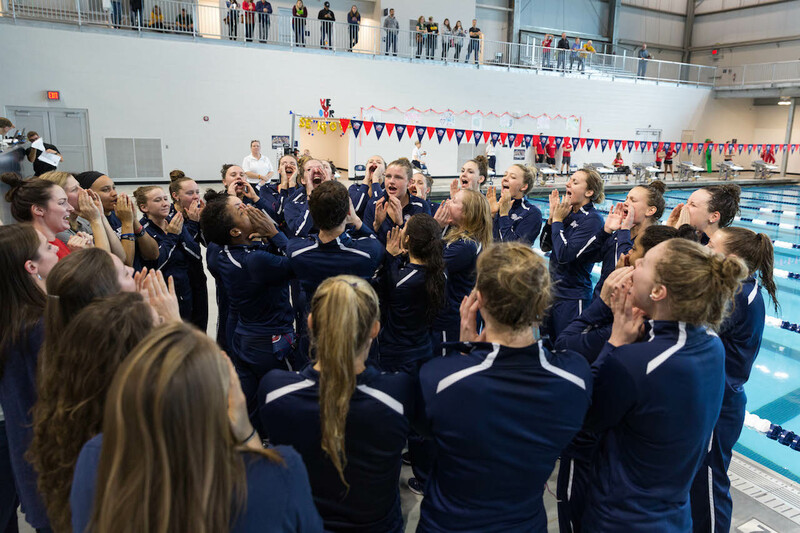 Zimcosky described Liberty swimming and diving’s culture to be one that cultivates success out of joy for each other, for the sport and for the training. According to Zimcosky, the goal is finding joy consistently throughout the tough parts of the season and then carrying that through to the conference-level meet where joy can still be the foundation when they are experiencing the pressure. Finnigan said she is already looking forward to the meet and that it has not yet fully hit her what it means to have her last conference swim take place at her home pool. The Lady Flames will travel to James Madison on Saturday, Oct. 20 to compete against the Dukes at 11 a.m. Excellent article. We are so thrilled to be a part of the Liberty Flames Swim and Dive family. Looking forward to a great season with an amazing group of young women. Go Flames! !